Sherwood Lakes community is sold out and is not in active development by builder. If you are interested in Sherwood Lakes or similar new home communities, contact us today! Our agents are very familiar with new and newer construction in Virginia Beach, and can identify resale opportunities in Sherwood Lakes, as well as builder inventory available in nearby or similar communities in Virginia Beach. To view 10 more pictures, interactive maps and the full, detailed description of the Sherwood Lakes community, please Login. The new construction neighborhood of Sherwood Lakes offers quality homes for sale. Looking for a townhouse? They have it. Looking for a single-family home? They have it. Looking for a home site to start that custom built home on? They have it. This trend of having it all continues throughout the community giving homebuyers what they want in a nice part of town. 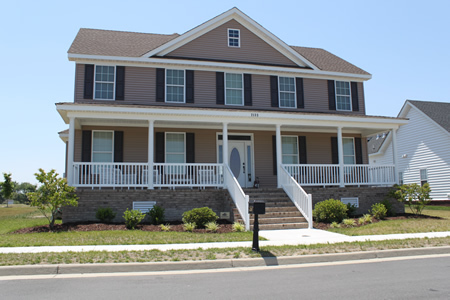 Located in Virginia Beach, VA, this collection of homes is not far from military bases NAS Oceana and Joint Expeditionary Base Little Creek-Fort Story. Buyers have choices to make when they think about purchasing one of these new construction homes. Select from one of the single-family homes or pick a home site and begin building. A third option, the townhouse, is for those who want a low-maintenance lifestyle. Several models are available for both townhomes and detached homes for sale. Some come with as few as two bedrooms and 1,275 square feet and go up to four bedrooms and 2,569 square feet. Sherwood Lakes wants homebuyers to be able to make their own decisions when it comes to their own personal housing. Life in Sherwood Lakes typically revolves around landlocked bodies of water. Homes for sale here come with unlimited lakeside breezes that hit the spot in a hot, Virginia summer. Two large lakes are available for kayaking, canoe paddling and fishing. Walk out of that townhouse and over to the playground with the kids. Stay fit with the walking trails that peacefully meander through this new construction development. This community is located in the section of Hampton Roads called Pungo. Known for family run farms and the Annual Pungo Strawberry Festival, this is a place where residents can have their cake and eat it too. Golfers can play rounds of golf on various courses at Heron Ridge Golf Club, Virginia Beach National Golf Club and Hell’s Point Golf Course. Shopping, entertainment and dining can be found at Red Mill Commons. Discover that new townhouse or single-family home you’ve been seeking in a Virginia Beach haven. Homes for sale appeal to those wanting to put the fun back in their lives. If you think you could settle down and live the life of Reilly, welcome to Sherwood Lakes. Send me more information about communities similar to Sherwood Lakes. Our agents gladly offer FREE property tours of Sherwood Lakes, Virginia Beach and homebuyer consultations to all serious buyers.